Submitted by pinstripe52 on Wed, 04/17/2019 - 11:51am. Here is an example of a well executed hand painted billboard. Usually a journeyman painter would do the pictorial and an apprentice would letter the text. Typically the design would be created by some ad agency who would contract with the billboard owner (Parker) to execute the project. Looks like this was painted indoors on tin panels which were then nailed to the background of the board. Submitted by VictrolaJazz on Mon, 04/08/2019 - 9:38am. Adapted as a popular tune by Leonard P. Breedlove in 1850. Submitted by Doubleclutchin on Sun, 04/07/2019 - 7:05pm. The 1939 model year fell well short of being a happy one for Buick in light of its decision to economize by using a shortened chassis for the division's Special and Century models, which led to structural failures in the rear of the cars' bodies. No doubt a few engineers and execs were cashiered to career Happy Land over that one. "There is a ... "
Submitted by jsmakbkr on Sun, 04/07/2019 - 3:31pm. 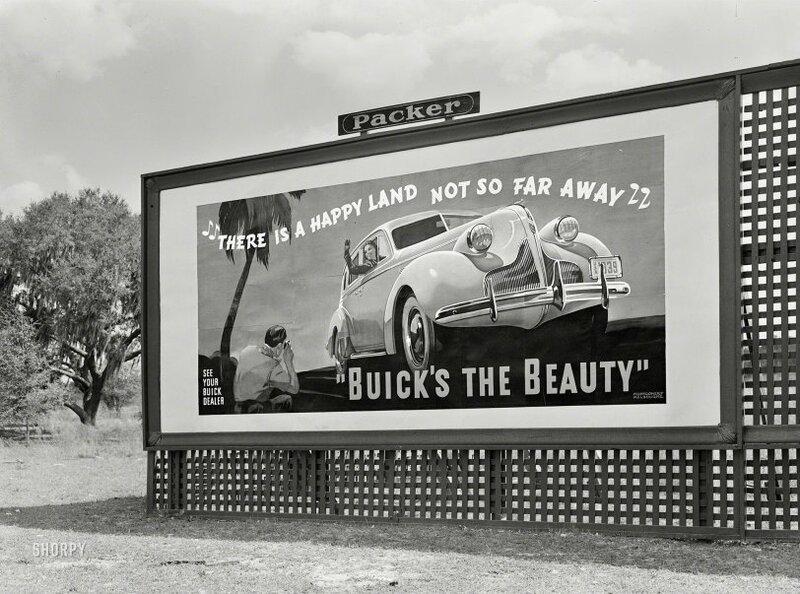 The second line of the hymn "There is a Happy Land" is "far far away," so this billboard was a play on its words. But it was not nearly as clever as one 19th-century parody of it, which Mark Twain, among others, was urged by his children to sing. Where they give ham & eggs three times a day.